In industrial situations, many materials need to be weighed. There are a variety of industrial scales that are used for this purpose. The specific type of scale selected is dependent on a number of parameters, including the capacity of the scale, the platform size of the scale, data communication capability, and most importantly, the accuracy of the scale. In the formulation of chemicals, it is not uncommon to need to mix a number of different ingredients to obtain the final product. Some of the ingredients can be quite inexpensive, such as sodium chloride, or salt. It is not particularly important to weigh this ingredient to a high precision if cost is the only concern. A standard industrial strain gage scale with a typical accuracy of 1/10 of 1% will be more than adequate. On the other hand, if high purity lithium nanoparticles were being mixed into a 100 lb batch of other ingredients, it would be critical to weigh them with the highest precision possible. One pound of this material could cost more than one thousand dollars. Using a strain gage scale with a capacity of 100 lb could yield an error as high as .1 lb, at a cost of $100. Higher precision scales could reduce these costs by 90% or more. Arlyn Scales offers an Ultra Precision Scale with a capacity of 100 lb and an accuracy of 1/100 of 1%. This scale uses a technology that has been patented both in the US and internationally. Special Surface Acoustic Wave (SAW) transducers measure tiny levels of deflection in the rugged load sensor. The scale can display increments as small as 0.001 lb. If we use the same example noted above, the error for the nanoparticles will now be .01 lb or less, at a maximum cost of only $10 per batch. A production line with a throughput of 1 batch an hour would yield savings of $720 in just a single shift. Clearly, this high precision scale will very quickly pay for itself. Throughout the industrial world, ink, dyes, stains and paints are carefully formulated to provide consistent colors. When Chevrolet is painting their Corvettes Supersonic Blue Metallic, they need to be confident that every panel of every car will very closely match every other. Any deviation will impact the overall perceived quality of the vehicle. Similar issues affect inks that are used for retail packaging and advertising. Every box of Corn Flakes should be the same shade of yellow. In many cases, a color is formulated with a base material, which is usually white, and then a number of concentrated color pigments. The base material can often constitute more than 99% of the material. Most of the remainder may be taken by two or three pigments. The remaining pigments may contribute just trace amounts, but they are still critical to the final results. For a batch of 100 lb, the base will be 99 lb. The two or three major pigments will likely be about 0.2 lb each. A standard 100 lb industrial scale has resolution of 0.02 lb. This can cause the measured amount of that pigment to be incorrect by as much as 10%. The Arlyn high precision SAW 100 lb scales have standard resolution of 0.001 lb. In this case, the error will be reduced to _ of 1%, or even better. This will be critically important in correctly producing the exact desired color. The trace pigments require even higher precision. 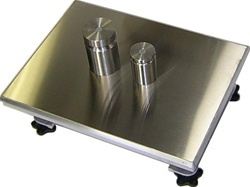 The 100 lb SAW scale can be calibrated in a special high resolution format which will provide resolution of 0.0002 lb. This allows the trace materials to be properly added. High Precision Scales are the tools that make this type of color matching feasible. It is often necessary to determine the number of parts in a container. These may be medical parts, castings, hardware items, electronic components, or virtually any other type of part. While it may be possible to count these items by hand, it quickly becomes impractical if there are a large number of parts in the container, or many different types of parts to count. Parts counting scales have been a standard tool to use for this type of counting. Typically, a small number of items are counted by hand, such as 10 pieces or 25 pieces. They are placed on the platform, and a button is pushed to tell the scale the number of pieces. Internally, the scale divides the weight that it is seeing by the number of parts in order to calculate the weight of a single piece. Next, the container of parts is placed on the scale platform. After subtracting the weight of the container itself, the scale determines the weight on the platform and divides it by the previously determined piece weight. The result is the number of pieces in the container. The most critical part of this process is accurately determining the piece weight. Even small errors in doing this will result in large errors in the final count. If the containers have a maximum weight of 25 lb, we can choose a scale with that capacity. The resolution of a standard 25 lb industrial scale is 0.005 lb. If 10 parts are used to acquire the piece weight, and the total weight of these 10 parts are .05 lb, the potential error in the piece weight can be as high as 10%. If the container holds 5000 pcs, the total part error could be as many as 500 pieces. This error can be reduced if a much larger sample size was used, such as 100 parts. But this takes much more operator time to hand count those parts. If the high precision SAW scale was used with the same 10 piece sample, the sample error would decrease to 4/10 of 1%. In this case, the part error due to sampling error would be reduced to only 20 pieces. It quickly becomes clear that high precision scales offer significant cost efficiency and time savings. Our experts are happy to help you decide which scale will be the best fit for your operation. Call us at 800-645-4301 or contact us online.